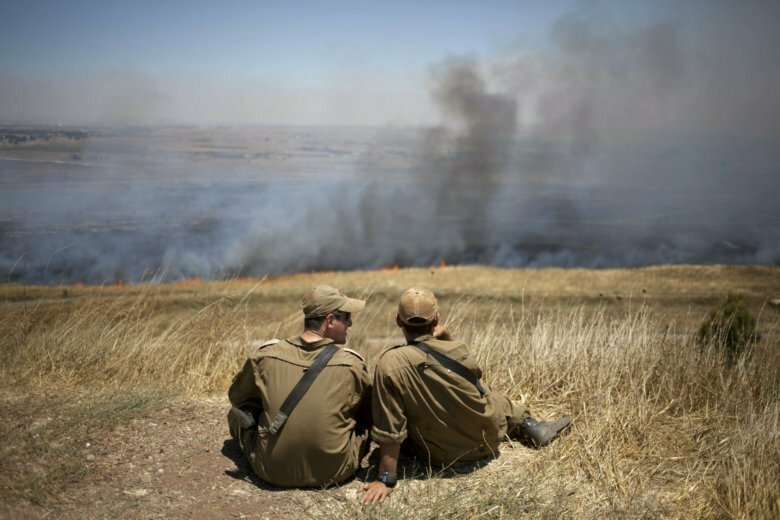 BEIRUT (AP) — President Donald Trump’s move to recognize Israeli sovereignty over the Israeli-occupied Golan Heights turns the tables on decades of U.S. diplomacy and international law and threatens to further inflame regional tensions. It is unlikely, though, to have much impact on the actual status of the territory, where Israel acts with full military control despite the lack of international recognition for its annexation 38 years ago. WHAT IS ITS POLITICAL AND STRATEGIC SIGNIFICANCE? The Golan Heights is a strategic high ground at the southwestern corner of Syria with stunning, broad views of both Israel and Syria below. It is roughly about 1,200 square kilometers (460 square miles) and borders the Sea of Galilee. Israel captured the territory in the 1967 Mideast War and annexed it in 1981, a move that was never recognized by any country in the world. For then-Syrian President Hafez Assad, the father of current leader Bashar Assad, the loss of the Golan Heights left a gaping wound, and he held various rounds of talks with the Israelis aimed at recovering the territory. The two sides appeared close to a deal in 2000, but disagreement over its fate ultimately foiled the talks. For Bashar Assad, recovering the territory has been more of a rallying cry than a genuine concern. The civil war in Syria over the past eight years has been the priority and the areas adjacent to the Golan nearly fell to the rebels at one point . The Golan front has been mostly quiet since 1974, a year after Hafez Assad mounted a failed attempt to retake the plateau. The U.N. Disengagement Observer Force, known as UNDOF, was established to monitor the cease-fire in May 1974 by a U.N. Security Council resolution. Israel has built dozens of settlements in the Golan over the years, with an estimated 26,000 Jewish settlers living there as of 2019. Roughly the same number of Arabs live there, most of them members of the Druze sect of Shiite Islam. Settlers have built wineries, boutique hotels and a ski resort, transforming the picturesque area into a popular region for Israel’s domestic tourism. The Sea of Galilee is also Israel’s main reservoir. In contrast to the Palestinian territories captured in 1967, the Golan has remained quiet under Israeli rule. While most of the Golan’s Druze have chosen not to take Israeli citizenship, they hold Israeli residency status that gives them the right to travel and work freely. Residents speak Hebrew. Still, the community largely sees itself as inextricably linked to Syria. Many of the families living in the occupied Golan are separated from family in Syria. In past years, particularly before digital technology, they communicated with their brethren on the Syrian side through megaphones placed on two opposite sides of a valley named the “valley of tears.” Before the war, brides would often cross at the border pass of Quneitra. WILL TRUMP’S DECISION HAVE AN IMPACT? Trump’s decision won’t change the status of the Golan as occupied territory in the eyes of the U.N. and most of the international community, although it may not be easy for a successor to reverse a decision once it has been made. Michael J. Koplow, policy director of the Israel Policy Forum in Washington, said Trump’s move may even signal to Israeli politicians that they can argue for the annexation of the West Bank. It could embolden other leaders who have seized territory in violation of international norms, such as Russia’s action in 2014, when it seized Crimea from Ukraine . “This has a huge impact in terms of condoning occupation and has very negative implications if you’re looking for peace in the Middle East,” said Nikolaos Van Dam, an expert on Syrian War and former special envoy of the Netherlands to Syria. Trump’s decision could be, in a way, a boost for Assad as well as Iran, Hezbollah and the so-called axis of resistance, allowing them to change the conversation and switch focus from the Syrian civil war to Israel’s occupation of the Golan. The Arab world is divided, and U.S. and Israeli officials may be betting no one will go to battle for Assad at this point. Still, Arab occupied land remains a sensitive topic, even though Gulf countries may be more interested right now in partnering with Israel against Iran than in upholding notions of Arab nationalism. Even regional states opposed to Assad, while they may secretly rejoice at Trump’s decision, will find it difficult to support it publicly. The head of the Arab League, which suspended Syria’s membership in 2011 over his handling of the civil war, rejected Trump’s move and said the League fully supports Syrian sovereignty over the Golan Heights.